An innovative evidence-based intervention is helping social workers who work with at-risk parents, foster or adoptive parents, and other caregivers of children with attachment disorders. It's the joy of all parents when their infant lights up when they return from an absence, is soothed by their presence, and draws close for comfort. But children who have experienced neglect, maltreatment, or a rupture in care are more likely to push away or disregard their parents. In response, the parents may feel unneeded, rejected, or incapable of comforting their children. Consequently, they may become less responsive, possibly neglectful, and may even display behaviors that frighten the child. The absence of adequate and appropriate nurturance results in an insecure attachment, which can have both physical and behavioral consequences for the infant. In recent years, an evidence-based intervention continues to be validated as a powerful tool for social workers and others who work with at-risk parents, foster or adoptive parents, or other caregivers. The Attachment and Biobehavioral Catch-up intervention (ABC), developed and evaluated by Mary Dozier, PhD, and her team at the University of Delaware, is an innovative approach that both addresses and helps prevent disorganized and insecure attachment that may result when infants and toddlers experience the traumatic effects of toxic stress. It teaches parenting skills to caregivers of infants whose families have undergone a rupture or crisis in care—perhaps through adoption or the intervention of child protective services—to create a more regulated and predictable environment for the infants that enhances their ability to regulate their emotions and responses to internal stress. Although Lisa Berlin, PhD, an associate professor at the University of Maryland School of Social Work, who has conducted randomized trials of ABC, believes the program could deliver substantial benefits to all new parents, it's intended for parents of young children who have experienced adversity, according to Dozier, who adds that "Adversity can take many forms and can be in the past or ongoing." It's targeted toward those experiencing disorganized attachment, which she describes as "a very specific type of attachment coded on the basis of the child's response to the caregiver upon reunion." According to Dozier, affected children "show anomalous behaviors that fit into one or more of seven types specified by Mary Main, PhD, and Judith Solomon, PhD, psychologists known for their important research on attachment, including such things as freezing—no movement for 20 seconds and resisting gravity—or stilling for 30 seconds, and apprehensive behavior (e.g., hand to mouth and step back when parent enters room)." The adversity leading to these behaviors typically is linked to maltreatment or disruptions in care that may stem from placement in foster care as well as domestic and international adoption, as well from other types of loss or trauma. ABC has not been used for discontinuity in care caused by the death of a parent, but Dozier suggests it might be equally appropriate in such cases. Dozier, the Amy E. du Pont Chair of Child Development and a professor of psychological and brain sciences at the University of Delaware, identified the most crucial issues and needs for children living with this kind of toxic stress. She then designed the intervention to ensure that caregivers recognize the parenting behaviors that contribute to an insecure attachment in children and to enhance nurturing behaviors that foster trusting relationships. By developing more organized attachment, children are better able to depend on their caregivers and to regulate themselves biologically and behaviorally. The ABC Intervention is implemented through hourly sessions generally delivered once a week for 10 weeks by specially trained parent coaches. While the sessions focus on the parents and caregivers, anyone present in the home is welcome to take part. "During ABC, a parent coach supports parents and caregivers to respond to their infants' cues in attuned, sensitive ways in order to help their infants develop a secure attachment to them," says Elizabeth Aparicio, PhD, MSW, LCSW-C, an assistant professor at the University of Maryland's department of behavioral and community health in the School of Public Health. The intervention is focused on the behavioral targets identified by Dozier: helping parents or caregivers to provide nurturance to their children, to follow their children's lead, and to reduce frightening parenting behaviors, including, Dozier says, glaring, rough handling, and making odd noises or threatening remarks such as "Wait until we're home." During the sessions, a parent coach delivers content on topics related to these targets, including attachment, nurturing, reading children's cues, recognizing frightening parental behaviors, and how to address "voices from the past"—the ways in which parents were raised that affect their parenting in the present," Aparicio explains. "Key components involve engaging the parent and child in interactive, developmentally appropriate activities and in reflective discussion about key child developmental tasks and needs (nurturance, following the lead/synchrony, and not being frightening), enhanced by live coaching of parental skills using in-the-moment comments," says Karen Appleyard Carmody, PhD, MSW, an assistant professor at the Center for Child and Family Health (CCFH) in the department of psychiatry and behavioral sciences at Duke University. "Although there is didactic information shared, the most important part of the session is that the parent coach supports parents/caregivers by making these in-the-moment comments as the parents or caregivers interact with their children through play-based activities," according to Aparicio. In-the-moment comments are used by parent coaches to respond to and highlight parent-child interactions as they occur naturally in the home, Dozier says, adding that "the frequency and quality of these comments predict increases in parental sensitivity and decreases in parental intrusiveness." All sessions are video recorded, so the parent coach can play back portions of the session, either during the session or afterward, to help the parent to quite literally see the interactions they are having with their child, Aparicio says. "We've developed a clinician screening interview, which includes in-the-moment vignettes that ask the interviewee to generate examples of in-the-moment comments. We have found that the screening interview predicts parent coaches' frequency and percentage of on-target comments, both across initial sessions as well as longer term," Dozier says. Furthermore, she adds, "We have developed coding-focused in-the-moment supervision, which is implemented by expert coders and occurs in addition to the traditional supervision led by a PhD." The program, which is supported by a grant from the National Institutes of Health, is disseminated in 18 states as well as in five countries internationally. "Designed for parents or caregivers of infants 6 months to 2 years old, it's been used with younger infants, Dozier says, but modifications are required. "We think it's likely to have more powerful effects with children between 6 and 24 months than with younger infants, but we have not tested that specifically." Aparicio adds, "There's also a relatively new version for toddlers." ABC for Toddlers, Dozier explains, includes "calming children when they are upset, mad, or frustrated in addition to the infancy targets of nurturing and following the lead." "Most parenting programs are geared toward older children, so ABC is innovative in its focus on nurturing relationships between very young children and their primary caregivers," Aparicio says. Furthermore, Dozier says, "What's different about our intervention is that we emphasize the parent remaining psychologically and physically available to the upset child, thereby serving as a coregulator—rather than, for example, putting the child in a time out." There's no group version of the program because, as Dozier explains, "We see this as a dyadic intervention—it's critical that it be delivered in the home so that parents can practice the behaviors." While the benefits are well established, the limitations of the intervention are few. "ABC is a focused parenting and relational development program, so any discussion of the parents' or caregivers' own difficulties or other family needs are limited within that frame. Many of the families we serve as social workers have complex needs in multiple areas. Although ABC is highly effective as a standalone attachment-focused intervention, some families will need additional intervention to address concrete services, mental health, and substance abuse treatment needs," Aparicio says. In Hawaii, for example, she notes, "ABC is delivered within a larger home visiting context so that parents can seamlessly receive other supportive services and referrals as needed." According to Aparicio, "ABC has a clear approach based on developmental science. It's been proven effective with diverse communities across the United States, and parents find it helps them to understand what their very young children need in their moment-to-moment interactions." "Some think that it's not possible to effect such change in a relatively brief period of time, but our data suggest otherwise," Dozier says. Her research demonstrates that children who are participating in the ABC Intervention experience more secure attachment than do controls and significantly less disorganized attachment. Studies also show that when caregivers receive the intervention, their children have higher language skills, less anger toward caregivers, more advanced executive function, better inhibitory control, reduced levels of negative affect, and improved cortisol regulation as compared with controls. The research points to notable improvements as well in the parents who completed the intervention, who for as many as three years afterward were found to be less intrusive, more able to show positive affect, and more likely to follow their children's lead. Berlin's work also speaks to the effectiveness of ABC. Her research program focuses on community implementation of evidence-based interventions to support early child development in high-risk populations, especially through enhancing children's earliest relationships. She's conducted two randomized trials testing the ABC program in novel community settings. First, in a study that also included Appleyard Carmody, she demonstrated both feasibility and initial efficacy of the ABC program for high-risk mothers and their infants in residential substance abuse treatment. Currently, in collaboration with Brenda Jones Harden, PhD, a professor of human development and quantitative methodology at the University of Maryland College Park, who also began her career as a social worker, Berlin is completing a randomized trial of the ABC program. The trial includes 270 low-income, predominantly Latina mothers and their infants receiving home-based Early Head Start (Head Start for low-income infants and toddlers). The study is part of the federally funded Buffering Toxic Stress Consortium. Both of her evaluations, Berlin says, demonstrate ABC's beneficial influence on observed parenting behaviors in the home. Aparicio, whose research focuses on teen pregnancy and parenting, early intervention, and child maltreatment prevention, works with Hawaii's Department of Human Services, Child Welfare Services branch to examine whether it's feasible to deliver ABC as a supportive intervention and whether teen and young adult parents will find it acceptable. She's principal investigator for ABC4Keiki (keiki means child in Hawaiian), a collaboration between PACT (Parents and Children Together) and the Hawaii Department of Human Services, Child Welfare Services branch for the first study of implementation of ABC with teen and young adult mothers involved with child welfare services in Hawaii. In addition, as part of Berlin's current trial, Aparicio led a qualitative study of 10 first-generation Latina mothers who had received the ABC Intervention as a supplement to home-based Early Head Start services. "The mothers found ABC to be a helpful supplement and a good fit with parenting values in the Latino community," Aparicio says. Appleyard Carmody helps oversee ABC services at the CCFH. At the center she also worked with Dozier on learning collaborative to assess the dissemination of ABC. "The Learning Collaborative methodology was developed by faculty from the National Center on Child Traumatic Stress and the National Child Traumatic Stress Network [NCTSN] to address the barriers to implementing evidence-based practices in real-world community settings," Appleyard Carmody says. To date, she says, they've completed three learning communities in North Carolina, including approximately 50 parent coaches from 18 community agencies in the state, and have recently enrolled the fourth. "Our evaluation data demonstrate that our parent coaches are able to implement the model with fidelity, that families make improvements/changes consistent with the research evidence on ABC, and that the agencies are working on sustainability practices to continue to provide ABC in the community." ABC recently has been approved by Home Visiting Evidence Effectiveness (HomVEE), which lets agencies receive federal funding for work with ABC, and the California Evidence-Based Clearinghouse for Child Welfare (CEBC) has given it the highest scientific rating, indicating that it's highly supported by research evidence. While it may not be the only evidence-based tool for its intended population, those who work with ABC note strong advantages. Appleyard Carmody admits that comparing ABC to other evidence-based programs is difficult, if not unfair, noting the need for a variety of programs to meet various settings, communities, and family needs: "Services along a continuum of care can help best meet the needs of young children." However, she describes ABC's strengths as threefold. First, "it's brief, yet highly effective, and has significant research evidence to support its use with a variety of client families. Second, it's closely aligned with theoretical bases and empirical evidence—in short, it works." Finally, she says, "It meets families where they are—in their homes in the community—and uses effective strategies, such as in-the-moment comments and video feedback, to help parents effectively use key parenting strategies to see and celebrate their successes." Furthermore, Dozier says, in addition to the brevity of the intervention, advantages of ABC include "a strong empirical basis, with effects from randomized clinical trials on observed (not parent-reported) outcomes for child and parent behavior and biology and strong evidence for the intervention 'mechanism'—parental sensitivity." Moreover, she says, "We've identified what we do that's essential in changing parental behavior and have developed procedures for monitoring this on a weekly basis, thus ensuring intervention fidelity." "ABC is a brief, yet powerful, intervention for working with parents of young children. Its evidence base lends support to its capacity to change relationship patterns and developmental trajectories for young children who have experienced early relationship adversity," Appleyard Carmody says. "It can be 'layered' or integrated nicely with either ongoing home-based programs and curricula, such as Early Head Start, Healthy Families, and Parents as Teachers, to enhance relationships and boost family outcomes." According to Aparicio, "It's an excellent approach for supporting secure attachment of infants to their primary caregivers. This is an area that can be overlooked when serving high-risk families where the focus is often on crisis intervention, but attachment is critical to infant development and is an important part of strengthening families." "One flexible part of ABC is that being an ABC parent coach is not limited to any one profession and no specific degree or license is required," Appleyard Carmody says. Although there's no degree requirement, Dozier says, "We do have a screener that allows us to screen trainees with a very high probability of success." Training is described at www.infantcaregiverproject.com/training-in-abc. Caroline Roben, PhD, coordinates training and supervision and can be contacted at croben@psych.udel.edu. "Social workers, particularly the great numbers of those working in in-home settings with caregivers of young children, are often ideal for providing ABC. I think they can and will play an important role in the provision of ABC," Dozier says. 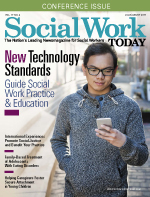 "It's a novel and important model that could enhance the work of many social workers working with ABC's target population," adds Appleyard Carmody, observing that it's garnered high praise and acknowledgement by not only CEBC and HomVEE but also other "highly reputable sources—NCTSN and SAMHSA [Substance Abuse and Mental Health Services Administration]—as an effective intervention, and its use is steadily spreading in the early childhood field."